Christopher is a partner in our litigation group, primarily practicing in the areas of Insurance Defence, Commercial Litigation and Arbitration, Municipal Liability, and Construction Law. Christopher has appeared in all branches of the Superior Court of Justice, and at the Court of Appeal for Ontario. He has experience representing clients involved in a wide variety of situations. Christopher is a skilled advocate and has enjoyed success for his clients both at trial and by the early-resolution of disputes. After developing a full understanding of a dispute, Christopher fearlessly advocates on behalf of his clients toward a positive outcome. Christopher also employs a practical approach in the resolution of litigious disputes, minimizing cost and delay. Christopher prides himself in continuing to achieve excellent results for his clients. Christopher grew up in Kitchener, and attended Preston High School in Cambridge, before attending Huron University College at the University of Western Ontario. In 2006, he graduated on the Dean’s Honour list with an Honours Bachelor of Arts degree in History. Christopher then attended the University of Ottawa where he received his Bachelor of Laws degree in 2009 and was called to the bar in 2010. While studying law, Christopher represented the University of Ottawa's Faculty of Law at the International Chamber of Commerce Commercial Mediation Competition in Paris, France, and authored two publications: an article on legal ethics published in the Osgoode Hall Review of Law and Policy and an article on international copyright law co-authored with Associate Professor of Law Jeremy de Beer, which appeared in the American Bar Association Law & Technology Journal, Jurmietrics. In 2009, Christopher returned to Kitchener to article at a full-service national firm. 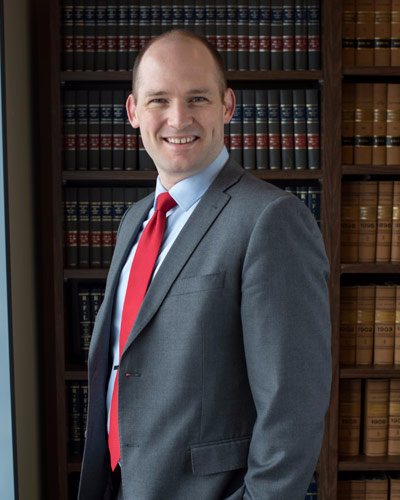 Following his Call to the Bar in 2010, Christopher worked as a litigation lawyer at a local full-service firm, then joined Madorin, Snyder LLP as an associate in 2011 as a member of the civil litigation team. Christopher was admitted to the Partnership in 2018. Christopher is involved in the local community in a number of ways, including significant involvement with the Grand Valley Construction Association. During his spare time, Christopher enjoys watching and playing hockey, SLR photography, travelling, and spending time with friends and family.